Our LGBT politics today resembles Greek Tragedy. There are the heros, striving to do the right thing, the villains, indulging their desire for power at the expense of others, the gods sitting above running their own little game on petty humanity, and the Greek Chorus foreshadowing the crisis, and payback is coming fast, bearing wisdom for the powerful. This week, Thursday, Friday and Saturday, Theater Transgression performs Antigone, written by Sophocles in the mid-400's B.C. The cast is all queer and trans, with an innovative video chorus featuring, among others, author Sarah Schulman, video artist Charles Lum, author/performer Kate Bornstein, choreographer Richard Move, poet Imani Henry, new media artist Sandy Stone, and musician Geo Wyeth. Think about this in terms of our fight for LGBT rights today, and tell me if you don't see any parallels. You know, pride goeth before a downfall, and all that. There are limits to power, even if it doesn't seem like it to the powerful. I'm going to the performance on Friday night. Buy your tickets here. Nothing like a little Greek Tragedy to lighten up your week, but payback IS so satisfying. Two brothers die fighting for the throne on opposite sides of a civil war. Creon, the new ruler decides to honor one, and disgrace the other by leaving him unsanctified and unburied, for animals to pick at. Antigone is the unfortunate one's sister, and defying the death penalty, she provides a decent burial. She's caught, and brought before the ruler. He denounces her immorality in defying his law, but she refuses to submit, instead denouncing his immorality. So he decides to bury Antigone alive in a cave, despite the fact that she's engaged to his son. A blind transgender prophet (yes, that's in the original) warns Creon that he will lose his own son as a consequence, and that all Greece will despise him, but Creon rejects the warning and denounces the seer as corrupt. But he eventually realizes, with a little help from the Chorus, that he done wrong, and tries to fix it. But it's a little too late: Antigone and her fiance kill themselves to avoid being buried alive, and when Creon's wife finds out, she also kills herself out of grief. The Chorus closes by saying that although the gods punish the arrogant, punishment brings wisdom. 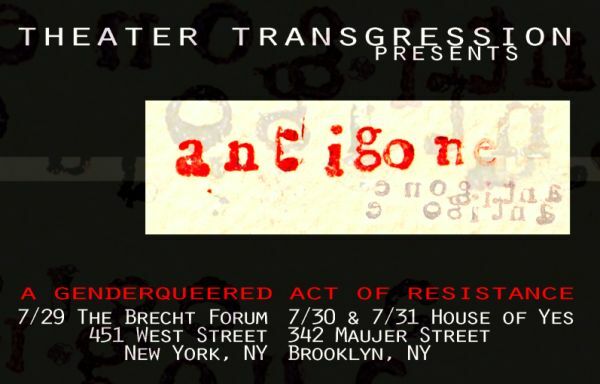 BROOKLYN, NY - A group of queer and transgender artists with backgrounds in performance, visual art, writing, filmmaking and social justice organizing recently joined forces to form a new theater company, Theater Transgression. Their first project, a full-scale production of Sophocles' ANTIGONE, will premier on July 29th, 2010, at the Brecht Forum. Working from an English translation by J. E. Thomas, the collective's interpretation of the play focuses on the characters' gender roles, as well as themes of war, power and resistance. "ANTIGONE has been adapted again and again over centuries to portray human rights abuses all over the world," says collective member Zavé Martohardjono. "But few productions have questioned the stereotypical gender roles of the characters. Ours is unique in that we dig into how gender, power and oppression work together - in the play and in our own lives." Jamie Roberts, who plays the title character, puts it this way: "Her struggle is to maintain her dignity and humanity in the face of the absurdity of a cruel state. Thousands of years later, humanity - and trans people in particular - still struggle with absurdly cruel states." The design of the show bursts with queer grandeur and flare. "The costuming is gutter glamour," says designer Aaron Blaise. "We started with themes of an intergalactic, post-apocalyptic Thebes - an explosion of color. We're creating wearable sculpture and re-imagined armor that extends the contours of our bodies and allows us to play with new ways of wearing our genders." I spoke with Bryn Kelly, a producer and cast member of Theater Transgression. Bryn said that the production is conceived as anti-militarist and anti-imperialist: the conscience of the individual versus the immoral demands of the State. "People forget we're involved in multiple wars. We as trans individuals are connected by foreign policy imposing on our lives, and the state imposing on our bodies." In response to my question, "Why Antigone?" - Bryn said the play is particularly interesting because of the unusual gender dynamics. A woman transgressing her role in ancient Greece? Unheard of. The ideal ancient Greek woman (and don't we have this ideal today as well?) is to be seen and not heard. But this woman, shockingly, makes waves, and acts in accord with her own conscience! And Creon's masculinity and attitudes about gender break down over the course of play. But, of course, it's too late by the time he gets around to it, but, oh, how much wiser he is then. The group plays with gender roles by costuming the cast in DIY gutter-punk glamour. It plays with the contours of bodies in interesting ways, pointing to our specific embodiment. Although Sophocles cast specific male and female roles, the group thinks of actors individually, going beyond just having trans-feminine actors playing women and trans-masculine actors playing men. More significantly, their personalities were matched to the roles so as to more fully inhabit the characters.The actor playing Creon not only identifies with Creon's masculinity, but his stubbornness and "big daddy" personality. Interestingly, the play has no "Director" role. Instead, the production is run as a collaborative effort. Another goal of the group is to create more opportunities in the future for trans people to get involved in the performing arts. L Train to Grand St.
Oh, dear, I love, love, love Antigone, I would love to see this performance. zomg i'm so in. If just to stalk kate bornstein. she's so rad. I have to admit, Jillian, that this really bothers me, on several levels. Yes, I can appreciate the gender studies aspect, but it feels... well, slammed together, without a whole lot of through-thought to make the concept work as a fully integrated whole. "Gutter-punk glamour" is just shorthand these days for "we cant afford anything better, we're gonna call it this to make it sound all arty": it's gotten used so often now that it's a theatrical cliché. And this is hardly the only Greek tragedy in which women rise above their place. Euripedes made his name as a playwright by creating roles for women that pushed the social envelope of ancient Athens: perhaps the company might want to take on The Trojan Women? I mean, here you have a group of women, held prisoners in a pointless war, who deal with a helluva lot more than just male privilege. In Antigone, things are not so cut and dry as the producer here suggests, because Sophocles wrote his characters more realistically than what was then accepted as theatrical depth (Aeschylus, following the tenets of theatre as ritual and worship, set that bar exceeding low) -- and you're left with more than just hubris and the retributionn of the gods. Yes, Creon, Oedipus, Heracles, all of them have their faults, but all of them are put into situations that, as Sophocles reminds us, were not of their own making. Oh, that's probably my fault, Sean. I don't think I explained it very well. But you sound so judgmental, ready to condemn it before seeing it. I don't think that's very nice. I debated whether or not to post this, because I had a feeling it would be received this way. My apologies for expressing a dissenting opinion. Yeah, Sean, I have to agree with you to an extent. Part of what makes Antigone such a strong Greek tragedy is that, in fact, both Creon and Antigone are in the right according to their respective positions. (and insofar as Greek tragedies about uppity women, you just don't get too much more uppity than Clytemnestra). Still, the gender dynamics are there and it really comes right out of Creon's mouth; I believe there is a line in there where Creon is actually aghast that it's woman who dared to defy his edict. But, of course, it would seem to be befitting of the daughter of Oedipus and Jocasta to transgress "nomos" being that her very existence is a trangression of "physis" in a sense. So, yes, there is a lot of depth to this particular play and there are many different ways to explore it; including the gender angle. Interestingly, I note that the Brecht Forum seems to be one of the venues where this is being shown, being as Bertolt Brecht also produced a version of Antigone. As I said, I would have loved to do some dramaturgy for this production, even given the elements of the Antigone story that this troupe wants to highlight. I remember reading antigone in high school. Thanks for the refresher on the story! And expressed without so much as a whiff of dismissive sarcasm - well done! Pressing on then . . . This production's premise seems such a wonderful, fertile space for constructive play on so many different levels. While I was yet performing (as a dancer trained in both classical ballet and Martha Graham techniques) I would have given my eye teeth for such an opportunity. Kate and Sandy in the chorus! Gawd! What delicious fun it must be. I'll pray that they get a good taping of it for later rebroadcast perhaps underwritten by the LOGO Network. With Sandy Stone involved I'll hope for the best. Please, please record this production for rebroadcast. I saw the preview performance last night. It was very enjoyable. If you're in NYC, I recommend it.